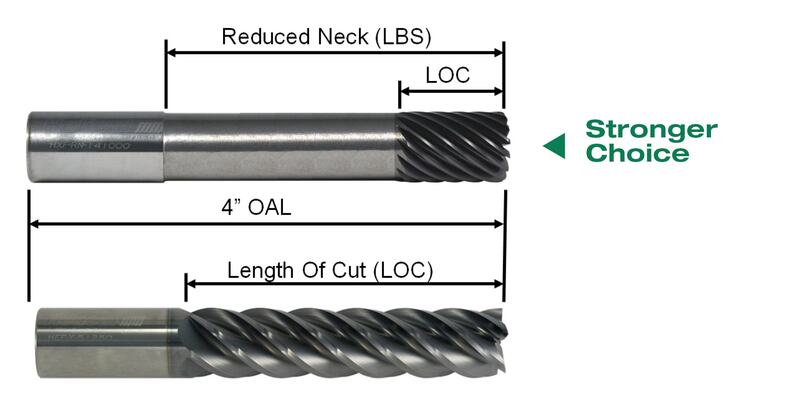 End mills feature many different dimensions that can be listed in a tool description. It’s important to understand how each dimension can impact tool selection, and how even small choices can make all the difference when the tool is in motion. Flutes are the easiest part of the end mill to recognize. These are the deep, spiraled grooves in the tool that allow for chip formation and evacuation. Simply put, flutes are the part of the anatomy that allows the end mill to cut on its edge. One consideration during tool selection is flute count, something we’ve previously covered in depth. Generally, the lower the flute count, the larger the flute valley — the empty space between cutting edges. This void affects tool strength, but also allows for larger chips with heavier depths of cut, which is ideal for soft or gummy materials like aluminum. When machining harder materials such as steel, tool strength becomes a larger factor, and higher flute counts are often used. The profile refers to the shape of the cutting end of the tool. It’s typically one of three options: square, corner radius, and ball. Square profile tooling features flutes with sharp corners that are squared off at a 90-degree angle. This type of tooling features flutes with no flat bottom and is rounded off at the end, creating a “ball nose” at the tip of the tool. The cutter diameter is often the first thing machinists look for when choosing a tool for a job. This dimension refers to the diameter of the theoretical circle formed by the cutting edges as the tool rotates. The shank diameter is the width of the shank — the non-cutting end of the tool that is held by the tool holder. It’s important to note this measurement when choosing a tool to make sure that the shank is the correct size for the holder being used. Shank diameters require tight tolerances and concentricity in order to fit properly into any holder. Overall length (OAL) is easy to decipher, as it’s simply the measurement between the two axial ends of the tool. This differs from the length of cut (LOC), which is a measurement of the functional cutting depth in the axial direction and doesn’t include other parts of the tool, such as its shank. An end mill’s overall reach, or length below shank (LBS), is a dimension that describes the necked length of reached tools. It’s measured from the start of the necked portion to the bottom of the cutting end of the tool. The neck relief allows space for chip evacuation and prevents the shank from rubbing in deep-pocket milling applications. This is illustrated in the following photo of a tool with a reduced neck. The helix angle of a tool is measured by the angle formed between the centerline of the tool and a straight line tangent along the cutting edge. A higher helix angle used for finishing (45 degrees, for example) wraps around the tool faster and makes for a more aggressive cut. A lower helix angle (35 degrees) wraps slower and has a stronger cutting edge, optimized for the toughest roughing applications. 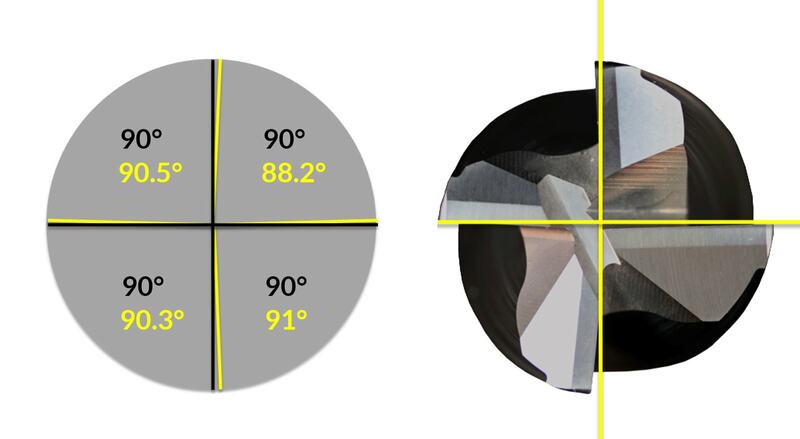 A moderate helix angle of 40 degrees results in a tool able to perform basic roughing, slotting, and finishing operations with good results. Implementing a helix angle that varies slightly between flutes is a technique used to combat chatter in some high-performance tooling. A variable helix creates irregular timing between cuts, and can dampen reverberations that could otherwise lead to chatter. Pitch is the degree of radial separation between the cutting edges at a given point along the length of cut, most visible on the end of the end mill. Using a 4-flute tool with an even pitch as an example, each flute would be separated by 90 degrees. Similar to a variable helix, variable pitch tools have non-constant flute spacing, which helps break up harmonics and reduce chatter. The spacing can be minor but still able to achieve the desired effect. Using a 4-flute tool with variable pitch as an example, the flutes could be spaced at 90.5 degrees, 88.2 degrees, 90.3 degrees, and 91 degrees (totaling 360 degrees). This article originally appeared as an In The Loupe blogpost. Harvey Performance Company is the parent company of industry-leading cutting tool brands Harvey Tool and Helical Solutions. The brands share their technical expertise on their blog In The Loupe, your source for machining solutions.